It never fails. If you want to understand the Trump administration, look to the women. To be clear, that’s “look,” not “listen” — they will not say anything helpful (or really, anything at all). But the visuals circulated of Trumpworld women — no matter how incidental or ridiculous they seem — always cast new light on our most urgent political crises. Case in point: Melania Trump in safari mode, especially Friday’s truly risible photo. There’s more to see beneath this photo’s cinematic and heedless cartoonishness. Let’s not just read this weird photo of Melania in a vacuum. We need instead to consider it in light of what’s going on here at home: Brett Kavanaugh’s ascension to the Supreme Court — and the effect this is having on women. Last week, our spokesmodel visited Africa, and the results were predictable. 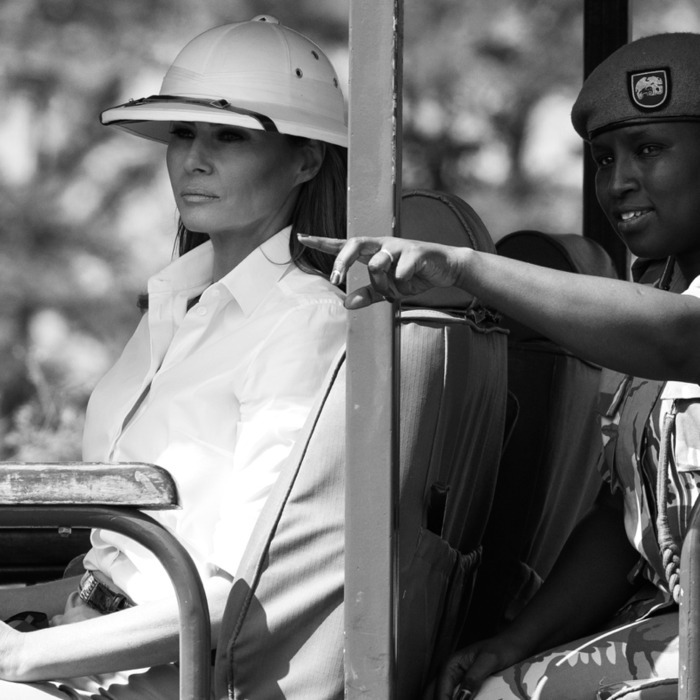 Melania seemed unaware that she was not in a 1950s safari movie and so obligingly ticked off every colonialist-Hollywood cliché in the book: She murmured language-primer-level phrases about the ‘tragedy of slavery’ (as if she’d just learned of its existence). She sang with orphans. She cuddled babies. She wore what looked like an entire Ralph Lauren line of colonial-chic: flak jackets, flak dresses (with shiny gold buttons), impeccably tailored chinos, and leather riding boots. The Ur-event that ignited this despair — the event now graven in our collective hippocampus — was, of course, Dr. Christine Blasey Ford’s emotional testimony last week. It is the image of Dr. Ford before the Senate that we need to examine alongside Melania’s safari photo. Christine Ford was a study in human expressivity. Her blue eyes widened with recalled terror, filled with tears, or grew serious. Her layered blonde hair seemed in perpetual motion, hiding and revealing her face by turns. Her voice ranged from high-pitched and tremulous to calm and professorial. Christine Blasey Ford was alive, mobile, human. All that vivid humanity did not matter in the end, though. The White House and GOP conspired to re-silence Ford, clamping their collective hand over her mouth, as well the mouths of Deborah Ramirez, Julie Swetnick, the 40-odd would-be corroborating witnesses, and millions of other Americans who care about sexual assault survivors, reproductive rights, and a just society. With this in mind, let’s revisit Melania’s safari photo. She may have been dressed in colonial drag, but look carefully: her expression does not say ‘imperial conqueror.’ This is not the face of an invading overlord. On the contrary, the First Lady’s face — as so often — is devoid of expression. Like a painted mannequin or a model in a fashion ad, she gazes into the middle distance. Note the contrast, for example, with her companion, park manager Nelly Palmeris. Palmeris looks animated. She leans slightly toward Melania, pointing at something. Are they encountering some giraffes or zebras? A flock of majestic birds? Perhaps. But whatever marvels lie beyond their tram, Melania looks unimpressed. Leaning against her seat, she seems unresponsive to both the guide and her surroundings, evincing no wonder or curiosity, not even polite interest. The First Lady’s face is the picture of rigid control: carefully made up, attractive but stony, emotionless, unresponsive — the precise inverse of Christine Blasey Ford’s expressive, ever-changing countenance. In contrast with Ford, Melania Trump offers us the numbed and deadened face of womanhood under the Trump administration. This is the mien the president and his minions both require and prefer: the face of a woman who does not react, a woman resembling an automaton, a doll — costumed in what amounts to a double-level simulacrum: a re-creation of a 1950s-style Hollywood look that was itself a re-creation of Victorian-era safari dress. In other words, Melania’s outfit sends us spinning back in time to two eras iconic for their repression of women. That is no coincidence. If Melania Trump serves any ‘ambassadorial’ function for her husband’s presidency, it’s not in her engagement with African leaders or geopolitics. She serves rather as an ambassador of female object-hood — as an exemplum of the kind of stoic, silent, dissociated affect of a pre-feminist era that would best accommodate Trump’s policies. Melania serves, that is, as an ambassador of womanhood past, as a time traveler representing the female passivity and silence desired by this administration. Melania on safari reminds us that in Trumpworld, women are little more than objects or screen fantasies — suitable for viewing, for hunting, for consuming at will. Women, in other words, are not unlike the animals presented for tourists on safari: interesting, alien, or exotic creatures to be assessed from a distance, even marveled at, but kept safely on the game preserve. These days, safaris are conducted only for the pleasure of observing animals, but people used to bring guns along on these expeditions, with the aim of bagging a foreign trophy to bring home. Big-game hunting still exists though, and we know it is a ‘sport’ favored by the younger Trump men. (Trump père restricts himself to bagging foreign trophy wives.) We’ve all seen the photos of Don Jr. and Eric smiling cruelly over their massacred treasures — gorgeous, lifeless leopards, elk, bears, and more. These beautiful animals too have frozen faces. They no longer make noise or react. They do not roar. But we still can, and we must. We cannot let the horror of the Kavanaugh affair (or any other current horror) freeze us into immobility. We cannot accept, internalize, or naturalize the Trumpworld version of feminine blankness and silence. It may be briefly satisfying to mock Melania in her pith helmet, but it’s a shallow distraction at best. Instead, let’s absorb the deeper horror that suggests itself beneath her blithe blankness. Let’s locate the suppressed scream beneath her masklike stillness. Let’s remember Christine Blasey Ford’s ultra-mobile countenance, the sound of her voice, the sound of all our voices, the force of our own creative, mobile expressions. We cannot slide into taxidermied compliance. Let’s push that hand off our mouths and roar.